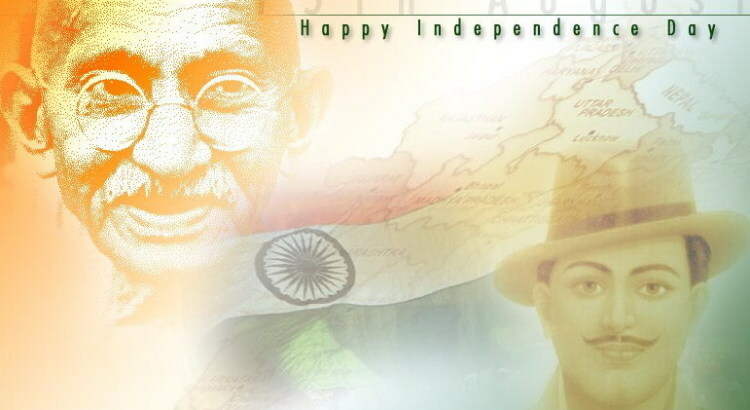 Are We Really Patriotic Towards Our Country? 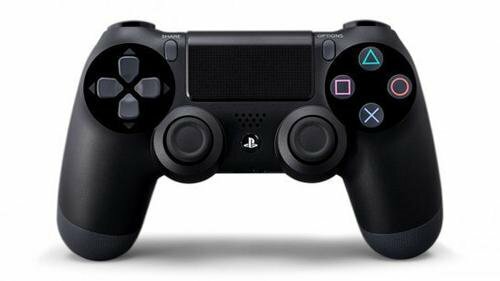 PS4 vs Xbox One – Which One Wins The Game? Are Film Promotions Going Crazy? Today’s global entertainment world especially in India, the promotions of the film in spite of a star cast has to be promoted in all available ways of media network, as now a days people go to movies based on reviews. Promotions are necessary for grabbing the initial eyeballs & getting the movie a good opening which is of paramount importance these days. Agreed that, promotions cannot sell a bad movie but it can make more out of a bad product. Film promotions have come a long way from posters & trailers to being promoted everywhere from serials to mails to events these days…. And that was the day we saw the most unlikely of sights. 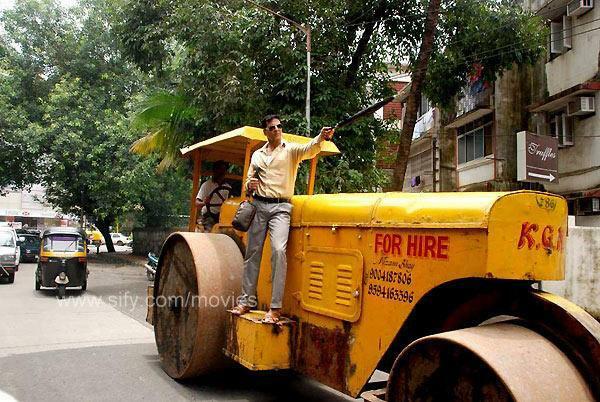 A dressed down Akshay Kumar carrying a bag and a tarried umbrella, making his way down the road on a road roller. In Aurangzeb the real estate industry is an essential backdrop. Thus the makers decided to keep the press conference at a construction site though the permissions were difficult! Excel entertainments Fukrey is a film about Fukra’s trying to get admission into a college. The marketing team launched the first trailer at a college canteen with benches on stage and served samosas & frooties! Abhishek Bachan felt doing stage shows was just not enough to spread the word about Ravan. 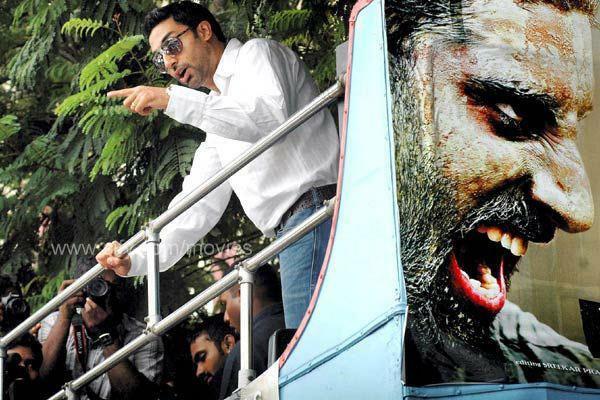 So he too hoped on a double-decker and toured out the town to come check out his film! Ekta Kapoor and Anil Kapoor became a part of the staged shootouts in NCR, Mumbai, to launch the theoretical trailer of the film ‘Shootout at wadala’! Being a promo attempt, Pandit Bhagawatji claimed that he married John and Genelia while shooting for a wedding scene in their film Force!! Mallika Sharawat always knows how to shock. And that’s exactly what she did when she walked down the Cannes red carpet with a humongous python wrapped around herself!! Finally the man who elevated this trend to a different level in the recent past, Amir Khan had pulled out all the stops when he started promoting his 2009 hit 3 idiots from dining with weavers to crashing a wedding. This actor did everything to get the spotlight! In late 70’s just a film poster were enough, later 80’s involved just few magazines in which stars used to talk about the film, gone are the days of appearance on TV shows! Movie makers these days are ready to experiment with unveiling look of their films. To reach to their set of audience they have become more creative. They have been creative in terms of how they communicate their films. But there is a flip side too, that a good promotional campaign for a movie can increase the expectations and if the movie is not to the mark the audience feels cheated and makes them think the stars were simply fooling them and some times the stars can also suffer from over exposure. Today there are some specialized agencies handling the film promotions but i am sure that in future the main stream advertising agencies will also start selling films the same way as they sell other products!! However a good movie with good actors and a good story line never need any kind of promotional activities. Vice-verse, how much ever promotion you do if the story is not interesting and the performance is bad, the movie will not work! !